In this post, we will try to figure out the relationship in score vs percentile and also understand the concept of raw score, scaled score, percentile, etc. What do we mean by Score and Percentile in the CAT Exam? Raw score is calculated based upon the questions that a CAT aspirant answers correctly or incorrectly. It has got nothing to do with relative mapping across different time slots. There will be 100 questions in the CAT exam. Based upon the above a raw score would be calculated for each section and for the overall CAT exam. This would be the candidate’s raw score. CAT 2018 exam would be conducted across two slots on 25th November – Morning slot and Afternoon slot. All questions in the two slots would not be the same. There would be some common questions but it is hard to say the exact number for them. This would mean that the difficulty level of the two slots, although close to each other – would be slightly different. Roughly an equal number of CAT aspirants would attempt the paper in each slot so if one of the slots is marginally tougher than the other, it would be unfair to roughly 50% of the aspirants. To take care of this issue, raw scores are converted into scaled scores. Suppose CAT aspirant A gets a raw score of 123 in slot 1 whereas CAT aspirant B gets the same raw score of 123 in slot 2. Let us assume that slot 1 was marginally tougher than slot 2. So, CAT aspirant A has performed marginally better than CAT aspirant B. So, when the scaling is done CAT aspirant A would get a marginally better scaled score than CAT aspirant B. Everything written till this particular point is absolutely true based on facts. Now, what is given below is assumptions based upon my personal experience of talking to students and looking at scorecards over the last few years. Given below are some deductions based upon those assumptions. Hopefully, this would answer some of the common questions by CAT aspirants. 1. Raw scores and Scaled scores used to vary drastically when CAT was conducted across 40 different slots. 2. For low scores (50 %ile), Raw scores and Scaled still differ a bit, although not as much as CAT 2010 / 11 when the paper was conducted across a large number of slots. 3. For scores above 80%ile, there isn’t much difference between Raw Scores and Scaled Scores. 4. Since the difficulty level is more or less the same, similar Raw Scores in two slots will lead to similar Scaled Scores. 5. The difficult level does not vary much across the two slots. FACT – It will have no impact on your raw score. GUESS – It will have negligible, if any, impact on your scaled score. a) It takes time to even blind guess. c) It is better to make an educated guess in 1 question than blind guess in 5. 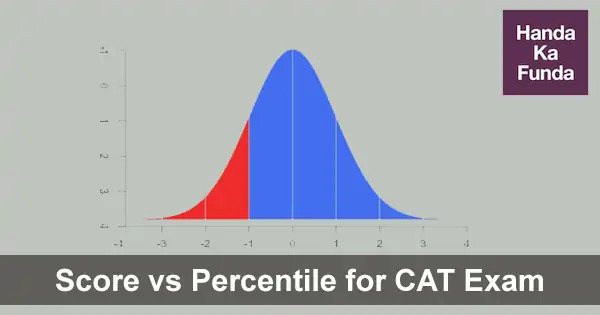 Percentiles in the CAT exam are like percentiles in any other field. These are just a representation of how many people are behind you in that test. Now you might be wondering, how come multiple people get 100 percentile in the CAT exam. I am sure you have seen those ads in newspapers. Well, that happens because of rounding off. Let me explain with an example. Suppose you get 6th Rank in the CAT 2017 exam which was taken by 200,000 people. This means that 199,994 people scored less than you. But the CAT scorecard only shows percentile up to two decimal digits. So, we would need to round this off. If we have to round this off to two decimal places, we will have to round it up to 100.00 percentile. Note: IIM Ahmedabad has around 200 seats in the general category. So if they selected the top 200 students based upon CAT score, they would have selected everyone above 99.9 percentile. Thankfully, that is not the case and they do consider a lot of factors other than the percentile. That is the reason you sometimes hear about candidates with really high scores not getting selected in the old IIMs. Please share this post on Whatsapp / Facebook. I am a b.tech first year student at NIT.I Love solving problems.i am scoring an average of around 120 marks in practice tests.I belong to OBC category. Would I get a seat in top IIMS?Kindly waiting for your reply.